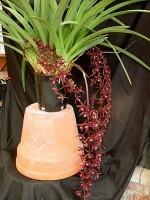 A select variety from the primary cross of Cymbidium canaliculatum and Cymbidium atropurpureum. The offspring have been summer-blooming with a multitude of very dark red flowers that bloom on a long and cascading stem. The flowers have a unique, earthy, coconut-oil scent. 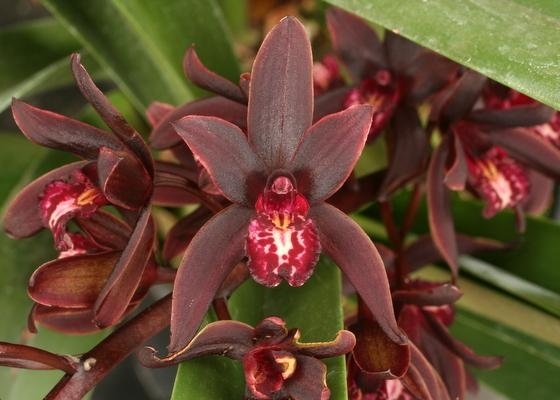 This variety blooms best for us indoors with the Phalaenopsis plants, and does only marginally well outdoors with cool growing Cymbidiums.Intermediate to Temperatu. July - August blooming.